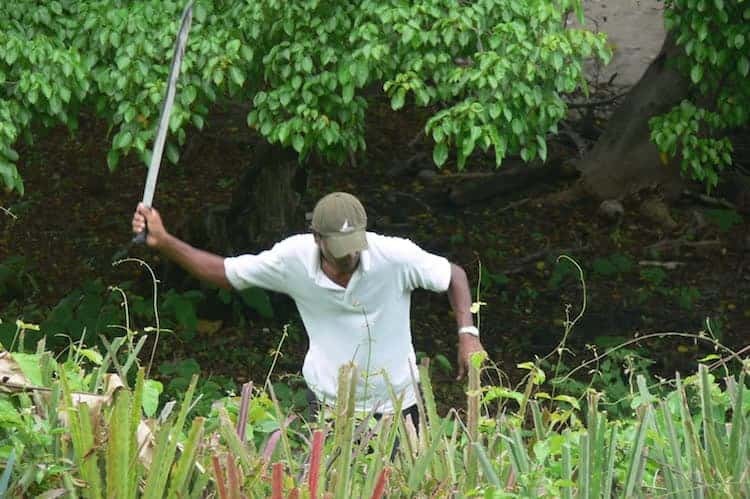 When using a machete you need to ensure that it is sharp. Otherwise, you will be working inefficiently and could even end up injuring yourself. So what it the best way to sharpen a machete, and how do you do it? That’s exactly what we will dive into now. There’s a number of tools you can use and each has there own method of sharpening. In the box below you will see our recommended tools for sharpening a machete. Keep on reading for our ‘how to’ guide on each. Before you start to sharpen your machete, it is a good idea to consider what you will be using your tool for. This in turn will determine the angle of the edge you should aim for, as well as the type of sharpener to use. If your machete is primarily used for cutting long grass and other types of non-wood vegetation, it is best to sharpen the edge to an angle of around 20 to 25 degrees. This will provide a razor sharp blade. Furthermore, because the vegetation is light, there will be less chance of the fine edge becoming damaged. A larger sharpening angle of 25-35 degrees is the way to go when cutting thicker, wood based vegetation. To chop through branches takes repeated strokes, and a more durable blade edge should be used. 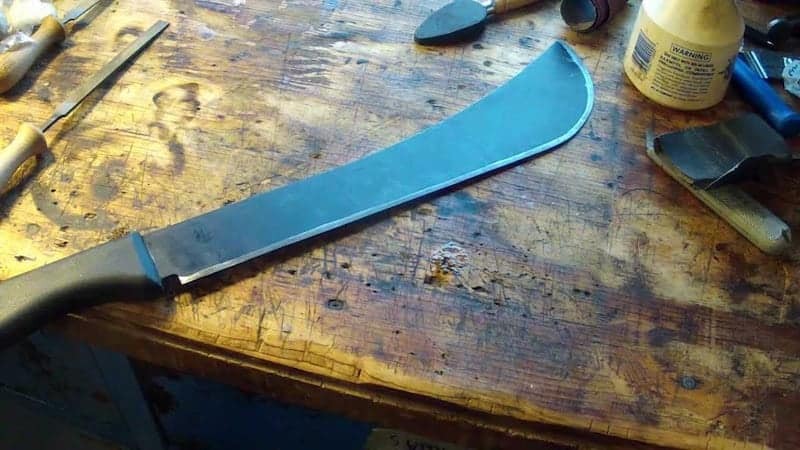 If your blade is new and does not have a sharp edge, or is old and damaged you should turn to a heavy sharpener to get your machete into working order. When a machete is dull or rusty, a lot of metal has to be removed before you can hope to have a sharp blade. 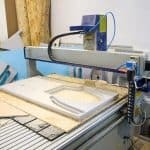 Doing this manually is time consuming; that’s where a belt sander or grinding wheel comes in. One of the best ways to sharpen a machete is with a belt sander. They are also relatively inexpensive to buy, and quick and easy to use. 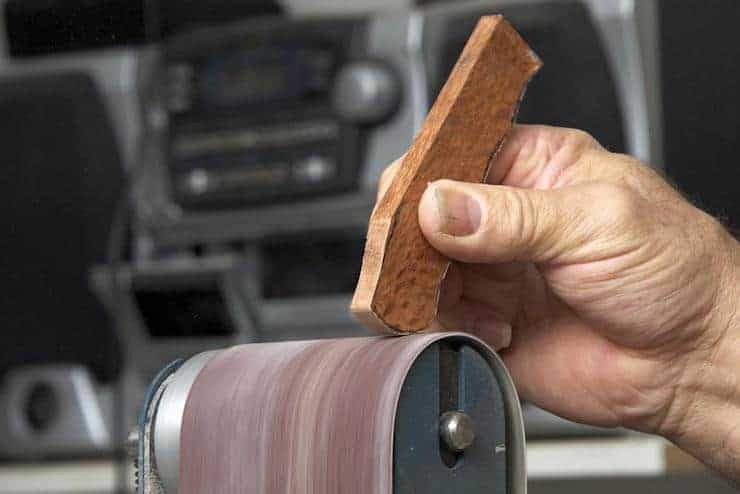 Controlling the degree of sharpening is actually quite intuitive with a belt sander (making them a good choice for beginners). It is simple to keep the blade straight over the sander. You also have a good level of control when it comes to applying the correct level of pressure. The Grizzly H6070 is an excellent belt sander (with added bonus of a disc sander too) for sharpening your machete. 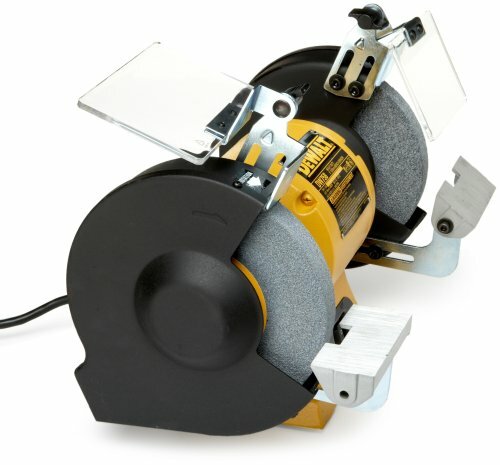 The 1/3 HP, 110V, single-phase, 3450 RPM motor is more than powerful enough to ensure you get no burn out no matter the aggressiveness of the sharpening required. Both the belt and disc sanding tables tilt up to 45 degrees giving you ample space and versatility with which to sharpen your tool. The Grizzly is also easy to operate; a beginner will be able to start using this sturdy belt sander to begin sharpening tools in no time. Highly recommended. 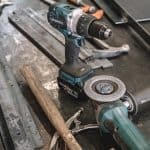 A bench grinder is recommended for those that have a little more experience with tool sharpening. 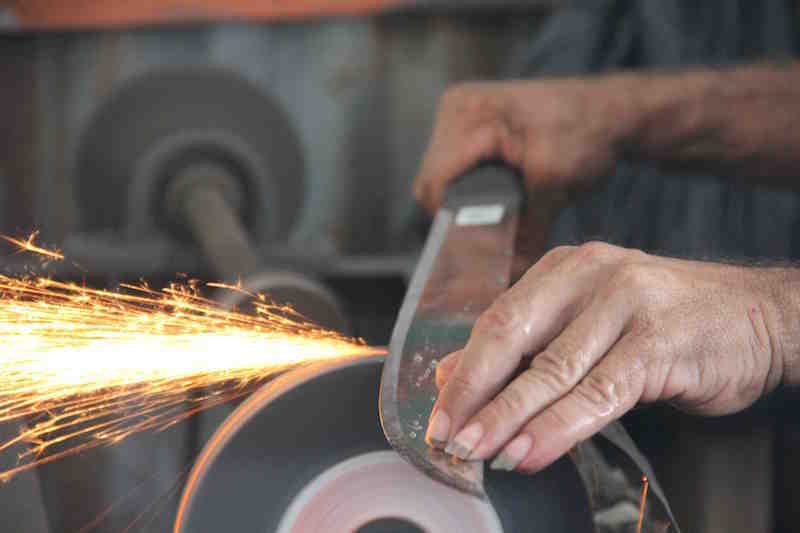 A grinding wheel is useful for removing the blunt edge of the machete blade. They are actually a lot more aggressive than a belt sharpener, (meaning it is easier to take off to much of an edge). Bench grinders are ideal if you have to remove chips from the blade, or are trying to restore a rusty machete back into a working condition. When using a bench grinder you need to make sure you have adequate space and won’t be disturbed by pets or children. It is important that you have enough room to pull the entire length of the machete blade across the wheel. If you are hindered in this, you will not be able to pull the edge across the wheel in a smooth and continuous action. The result will be an uneven finish. Overheating the blade is a very real problem with bench grinders, (and one of the reasons experience is required). It is easy to damage the machete if you do not know what you are doing. However, one way around overheating is to rinse the blade repeatedly between strokes. If you take care to ensure the metal doesn’t lose its temper the machete will be fine. 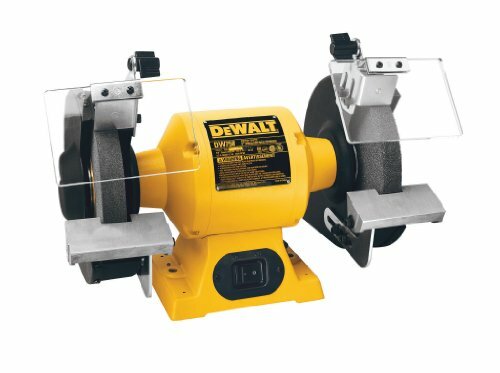 The DEWALT DW758 is a well built and reliable tool, and represents a fantastic purchase for anyone looking to sharpen their tools with a bench grinder. Ideal for all manner of grinding tasks, whether you are sharpening, deburring, removing rust or chips from damaged blades, this machine will step up to the job. Under the hood you have a ¾ horsepower motor that runs at 3,600 rpm for high speed material removal. (The motor also features overload protection in order to maximise longevity). This thing is built to last too. Utilising a rugged cast iron base, the DEWALT has a satisfying amount of bulk to it. That doesn’t mean that fine tuning work can’t be carried out however, the precision-machined aluminum tool rests allow you to accurately position work ready for grinding. To top it all off, DEWALT offer a three-year limited warranty covering any defects (due to faulty materials or workmanship). There’s also a one-year free service contract. Within this DEWALT will maintain the tool and replace any worn parts caused by normal use, absolutely free of charge. If you ready to take the plunge to sharpen your tools with a bench grinder, in our opinion, the DEWALT DW758 is the one to opt for. 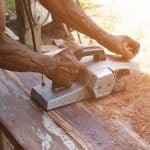 The least expensive option of sharpening a machete is the manual route: using a mill fine or heavy duty hone. This takes a little bit of arm-work. Mill files feature sharp teeth of different grades depending on the type that you buy. The best mill files will be double-cut on one side, (used for rough shaping) with a single-cut on the other side, for finer sharpening. The mill file is then pushed repeatedly over the blade (ensure that you use a pushing action, the teeth on a mill file are angled away from the handle, so you should not pull the file across the blade of your machete). 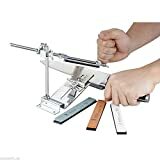 Alternatively, the mill file can be held in the vice and you hold the machete, moving it across the file edge to sharpen. A machete should be sharpened one edge at a time. This means you should consider the angle of each side too. A 30 degree edge is actually 15 degrees on either side. You may of course have a chisel ground machete with a sharp edge on only one side of the blade. It is important that you check this before you begin any kind of sharpening. When sharpening both sides of the machete blade you need to check for burrs. 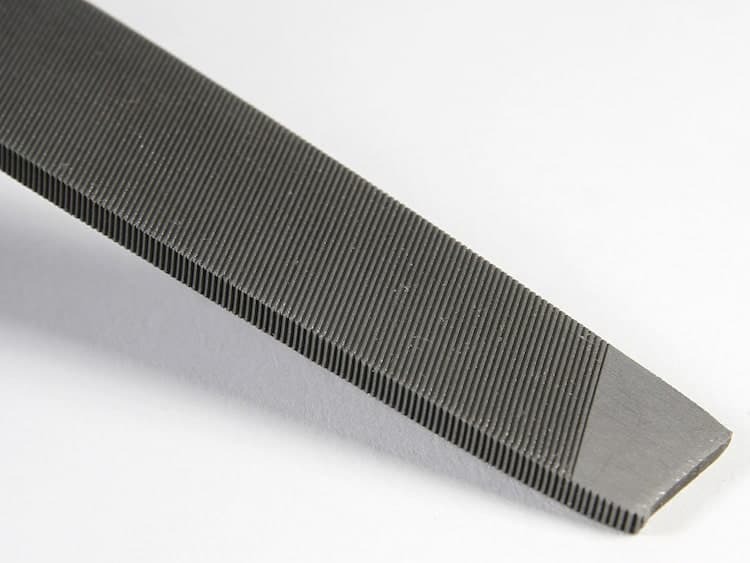 This is the raised, excess steel that occurs on the opposite side to which you are sharpening. Remove these to achieve a fine edge. 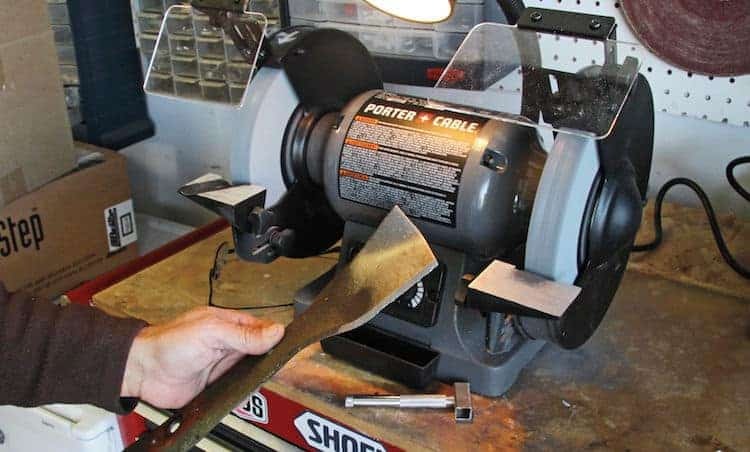 Mill files are great for sharpening machetes, and the fact they are less aggressive than say a wheel grinder means, as a beginner, you are less likely to damage your tool. How can you go wrong? 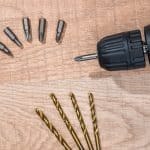 The ever-reliable Stanley have put together 4 excellent mill files that cover a wide range of filing tasks for the user. In the set you get a round, flat and triangle file. There’s also a very handy interchangeable bi-material file handle that can fit on each of the files to reduce vibrations as you work. Well built, and easy to use – if you after a good set of mill files to sharpen your machete, these are well worth checking out. Field sharpeners are a very handy tool for giving your machete a little TLC while you’re out working. 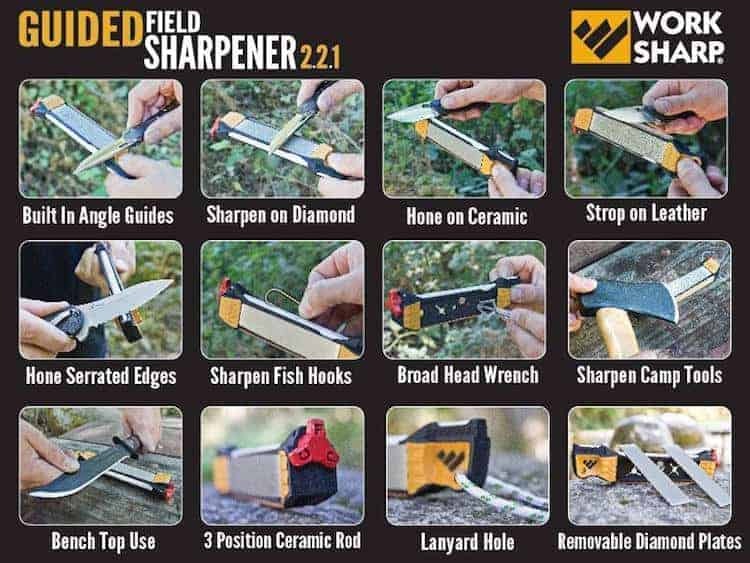 A good field sharpener will be the right size to chuck in the toolbox or kit bag, ready for some quick touch-up sharpening should your machete need it. In such circumstances you can reach for the field sharpener and address the situation there and then. However, with all that said, field sharpeners are too slow to use as a grinding device. They are primarily used for honing and polishing the edge while out on the job. The Work Sharp WSGFS221 is very convenient field sharpener that can be used for large array of sharpening tasks. 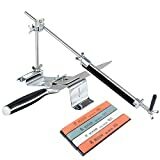 Featuring diamond plates, ceramic rods, a leather strop and sharpening guides this package really does have everything you need to provide a fast, easy and consistent sharpening results for your out door tools. 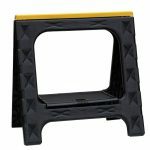 The Work Sharp kit is a well built sharpener that are highly effective. Well worth a look.